Early in the 20th Century, large numbers of African Americans began to leave the south and migrate north in search of opportunities. As African Americans in the south found it increasingly more difficult to find work and race-based violence against African Americans became more prevalent, they began to move north. In 1916, the impending war provided opportunities for employment in the factories in northern cities attracting unemployed African Americans to migrate north. The migration would continue for the next 50 years leading millions of African Americans to the great cities of the north. James Grossman, the Vice President of Education and Research at Newberry Library, models methods of interpreting primary documents as he leads a group of teachers from Kenwood Academy through analysis and interpretation of letters from the Great Migration. 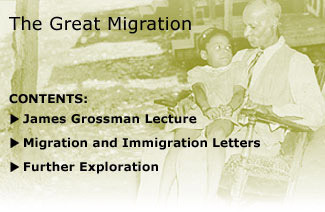 Letters from the Great Migration capture the experience of some African Americans before and after they migrate to Chicago.